Martin Professional, Kollision and Transform Architects have refurbished the exterior of the Confederation of Danish Industry building in Copenhagen, which now boasts a façade highlighted by an ever-changing LED media surface for a more engaging presence. The media façade incorporates 4,000 meters of Martin Professional’s VC-Strip in a customized outdoor solution, forming a harlequin pattern across the building on which a variety of graphic designs can be displayed. The LED strips are full-color RGB LED battens with each LED (over 90,000 in total) individually controllable in terms of color, brightness and intensity. 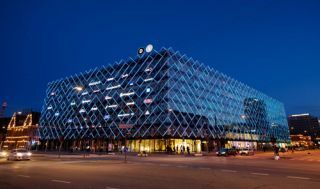 Content for the façade was created by Danish design firm Kollision, in cooperation with Transform, and allows the Confederation of Danish Industry to use the lighting fixtures as a dynamic interface between its brand, the building and the urban setting. The system gives the client’s internal communication department the freedom to transmit any look or expression they wish onto the facade. The player-system also includes an integrated weather service app controlling the brightness of the façade and be controlled and adjusted through a custom iPad app.